The British Ornithologists’ Union Records Committee (BOURC) has admitted Great Blue Heron Ardea herodias to Category A of the British List following the record of a juvenile on 7th December 2007 on St Mary’s, Isles of Scilly (sight record, photographed). The Great Blue Heron (herodias group) has a widespread breeding range in North America, from southeast Alaska, northern British Columbia, the central Canadian prairies, southern Ontario, southern Quebec, and the Canadian maritime provinces except Newfoundland, south to Florida, Texas, Baja California, and Central America at least to Belize and Guatemala. Its winter range extends from the Pacific coast south of 61°N through Central America, and mostly south of Canada and midwest United States. It includes the islands and coasts of the Caribbean south to Colombia. Various taxonomic arrangements have been proposed, but a single subspecies (herodias) is recognised for most of continental North America, with the exception of the northwest (fannini) and Florida (occidentalis). One record: juvenile, St Mary’s, Isles of Scilly, 7 December 2007. V race undetermined but probably herodias Linnaeus. There are two previous records of Great Blue Herons which reached British waters after being fed whilst aboard ship: one which was transported to Avonmouth in November 1968 and another which died within 150 miles of the Isles of Scilly in May 1982. Although ship-assisted vagrancy is a complication when considering records of this species, there have now been records from France, the Canary Islands, the Cape Verde Islands, and the Azores (about 23 records) which suggest that unassisted vagrants do reach the Western Palearctic. There was no reason to believe that the 2007 Scilly bird had been aboard ship, and the prevailing weather conditions (a near-continuous southwesterly airflow across the Atlantic created by two low pressure systems) were considered to support the case for unassisted vagrancy. 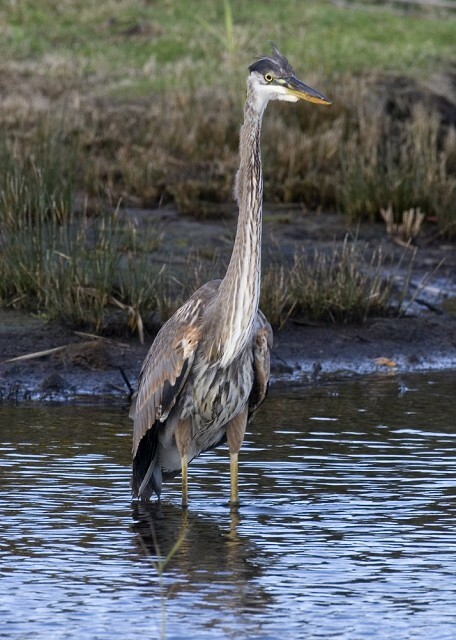 Accordingly, Great Blue Heron joins three other Nearctic heron species, Snowy Egret, Green Heron and American Bittern, on Category A of the British List. Bob McGowan, Chairman of BOURC, commented "This was one of the more straightforward assessments for a potential addition to Category A in the last few years, not least due to the very high standard of the submission documentation that included good quality images. Identification of a juvenile Great Blue Heron was easily established. There was no evidence to suggest the bird had benefited from assisted passage or any evidence of possible escape risk in Europe. Equally, the age of the bird, the date, weather and locality were convincing for genuine vagrancy. Without biometrics, a definitive statement on racial identity was impossible, though the Committee recognised that nominate herodias is the most likely on the basis of distribution and migratory behaviour. Following a speedy electronic circulation, Great Blue Heron was unanimously accepted to Category A". Adam Rowlands, Chairman of BBRC, commented “The identification of Great Blue Heron in a vagrant context has been well-covered (Birding World 11: 12-20). The occurrence of this species in the UK has long been anticipated, but it is still a considerable credit to the bird’s finder that he had an active search-image for this species and was able to confirm the identification and spread the news very quickly. Despite being a one-day occurrence, the finder also submitted excellent documentation in support of the claim, which made the assessment of the identification straightforward for BBRC”. The British List stands at 580 species. (Category A = 560; Category B = 10; Category C = 10).